Leaders, when is the last time you scratched your head wondering why your team culture or attitude isn’t what you want it to be? Why the ‘team’ isn’t succeeding at the level you expect or need? It may start with you. Is your environment a building environment with positive support, challenging expectations, and effective communication? Or do you have an energy draining environment? Teams that spend time being more productive are more engaged, happier, and sell and serve your customers more effectively. Here’s the tough part leaders…the environment depends on YOU! Your actions, words, and focus trickle down to the rest of your team. So, how do you build a culture that builds instead of breaks? I strongly believe that behavior that is recognized and rewarded is behavior that is repeated. Find the positive and note it. Reinforce what people are doing right. Encourage teammates to identify and share what their co-workers do that helps them. Set the expectation for your team that complaints need to be timely, relevant, and matched with something positive. Then when you hear a negative or complaint, thank the person for sharing and then ask them to also think of one positive for that situation or person. Do this consistently and you will see that pattern of thinking grow. Create a regular feature in your newsletter, team meeting, or company get together to praise people for specific actions and outcomes that you want further repeated. Does this all seem too ‘touchy feeling’ for you? Too bad. As a leader, your people’s productivity needs to be at its highest. Peak performance demands we set the tone for building our people which pulls out the best work, engagement, and productivity. 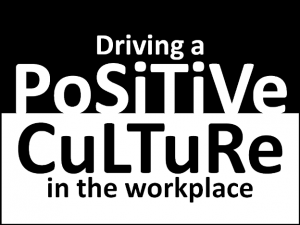 Your Turn: What do you do to build and encourage a positive team environment? Start the conversation and leave a comment below.